First up the manifold had to come off as there was no room at all to swing a cat !! Manifold nuts came off no problem as I had loosened them all off last week. Kept and reused them as perfect condition. I had been applying wd40 to the manifold/exhaust joint all week and this paid off as whilst I scrambled underneath to grip the exhaust John was up top wiggling and pulling at the manifold and sure enough it separated pretty easy in the end. So with the manifold out of the way we could crack on. Rather than me try to punch a hole through the plug and lever it out John wanted to give it a go with a small bolster gently (but with enough force) knocking it so it spun enough for me to get at it with a pair of grips and yank it out. The plug deffo needed replacing !! That hole in the plug was not caused by knocking it out so it really was past its use by date ! The remarkable thing was how clean the condition of the mating surface on the engine block was given the corroded plug we had just removed. John was astonished at how smooth it was but of course he did not want to let it go without making absolutely sure with a clean up. To bang the new plug in I found (after an initial panic) a socket that John was happy with as it was just a tad smaller than the plug itself so had a teeny bit of space as when the new plug got banged in it did not encase around the socket causing a right headache if it did ! So new plug fitted like a glove...and some ! TBH chaps it fitted so well and the surfaces were both as new I have not actually smeared any sealant around the joint. Both myself and John were happy in the end to leave it as it was. Any hint of a bit of seeping then maybe apply some but should not have to hopefully. Yep I know some do but as Paul G said himself if the surfaces really are that clean and the fit is good then should be fine without. We refitted the manifold which again there is no way I would have done this without John. Manifold was a bit more tricky to refit than remove but we got there. Whilst we were doing this John commented on how low my exhaust was sitting ( as per my post on another thread here recently) so we actually managed to get it higher after a neat trick by John using my ultra low profile jack and bit of wiggling to twist it so as to give it a better lie. Job very well done John !!! So next to test everything was ok we filled up the rad with plain water as John said no point wasting coolant if we found a leak and had to drain the system again. Great tip !! Now the bit I was waiting for...to fire up the Pinto for the first time in what seemed like years but was really only about 5 weeks (still a long time for me !). Engine running and building up to temp we kept an eye on the core plug, manifold fixing and exhaust joints and everything thank God was fine...no leaks....PHEW !!! After initial smoking of the manifold where wd40 was burning off it settled down nicely. We gave it plenty of time for thermostat to open and build up to operating temp and once we were happy we switched off and waited for everything to cool down before draining the system of the plain water and replacing with a coolant mix, again firing the Pinto up and keeping an eye on the plug and rad hose for leaks. All good ! The old coolant we originally drained was just about ripe for replacing too as it was showing signs it was getting on a bit so great to get a nice fresh mix of coolant/deionised water in the system. The last system drain I did was about two years ago so was just about the right time to replace it anyway. What a great job nick . Can’t belive how the old core plug has gone , also best of luck with the upcoming MOT . Also John nice 2.8i there as normal . Small note yes we did notice how clean that engine block is . Well played Nick and John. Terrific job! Of course both cars look stunning, as per usual! Andrew 2.8i wrote: Well played Nick and John. Terrific job! Andrew I was down in the garage before John arrived but I heard him a couple of mins before I seen him with those dam Janspeeds of his ! A job well done Nick. Paul G wrote: A job well done Nick. 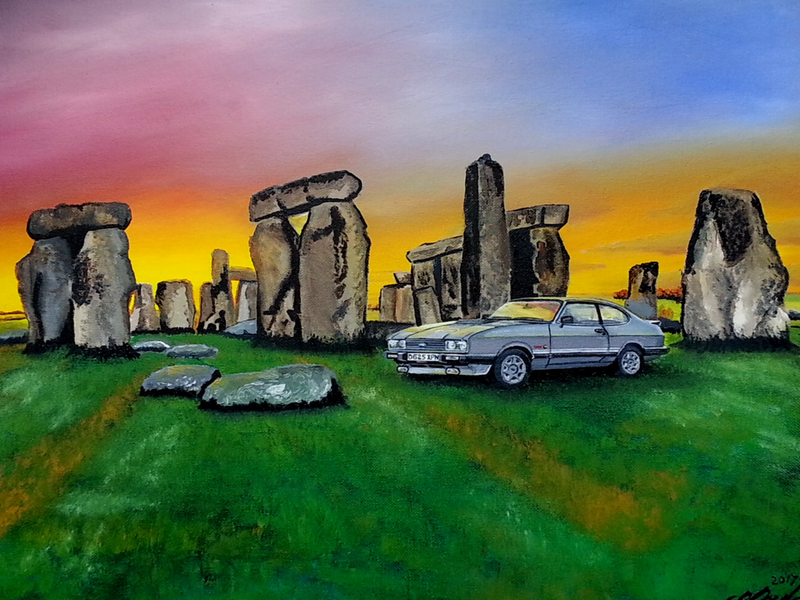 Fordoholic Nick wrote: Cant wait to get B112 out for a drive now mate but cant till I get the mot ! I guess you used your new wd40 with the fancy lid to soak those bolts. It's good that you've added a tutorial because it's great for reference to anyone thinking of doing it. I found the one of yours changing the centre console this morning as although I'd done it once before it was a great refresher. Hope to catch up with you both later in the year. I hope your centre console removal went ok mate. Glad my tutorial helped refresh you mate. Thanks. Was any HFVP involved at all...? Yep hope to meet up with you again too at some stage this year mate hopefully in our Cappa's and your son with his Mini too. As ever this was a pleasure to help Nick with, I do seem to to come away cleaner than when I arrive.... Also... You would not beleive how clean the block is in the flesh!!! Imaculate!!! Anyhow, while there Nick also handed me an Interior mirror for my time, (Which was not needed or expected...) which was Very Greatfully received!!! I have needed a new interior mirror for some time now as I can't use the Dip feature with out it falling off, (This is a little secret I keep about my Cappa, so Shhhh!!!!) Nick was aware of this and had got a really goood condition one, cleaned it up, applied some of his favourite paint to really bring it up to scratch, cleaned it some more and presented to me!!! It might not sound like much but I'm over the Moon with this!!!! One very happy Bunny!!! Cheers Nick, really was good of you to do this knowing how many Years I'd been going through the Bins at the classic car gatherings on the stalls!!! Nice work guys its what capri ownership is all about helping each other out with work on each other's cars. If I lived closer Nick I would've been more than happy to help as well. 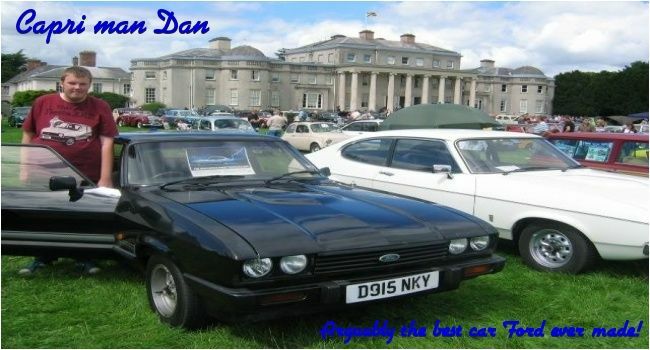 dan the capri fan wrote: Nice work guys its what capri ownership is all about helping each other out with work on each other's cars. If I lived closer Nick I would've been more than happy to help as well. Thanks Dan. That's very kind of you mate and yep I totally agree with you. Owning a Capri is like being part of a big family aint it mate Everyone looks out for each other and the offer of help is always there no matter how big or small. Dan I hope you are keeping well and hope to catch up with you next year...the 50th party year !! Take care mate.